You are not logged in. [Log In] Pond Boss » Forums » GENERAL QUESTIONS » Property Projects & Construction » What did you do at your pond today? Cut a large gumball tree down. Finally bought a saw that can handle larger trees. I think they're both HBG. #1 is a Male, #2 female. Thanks for the spell check....corrected. The one time my phone's auto correct didn't work!! Caught two more crappie from the pond today. Both over 11". I guess I should be happy that they've all been big. No sign of young fish, so maybe they've not been too successful with their spawn. I'm missing any signs that hint towards hybrid in fish two - no yellow margins on fins, etc. - what characteristics lead you to believe it's a hybrid? I dont think the female shows the yellow markings like the male does (spawning colors). Otherwise, the body shape of both fish especially the head and mouth, suggests GSF characteristics. Also note the ear tab on both, long on #1, short on #2, like BG. Busy weekend of working around the pond. Got the last brush pile burned up and cleaned up, ready to start a new season of habitat work around the pond with the dozer and excavator. 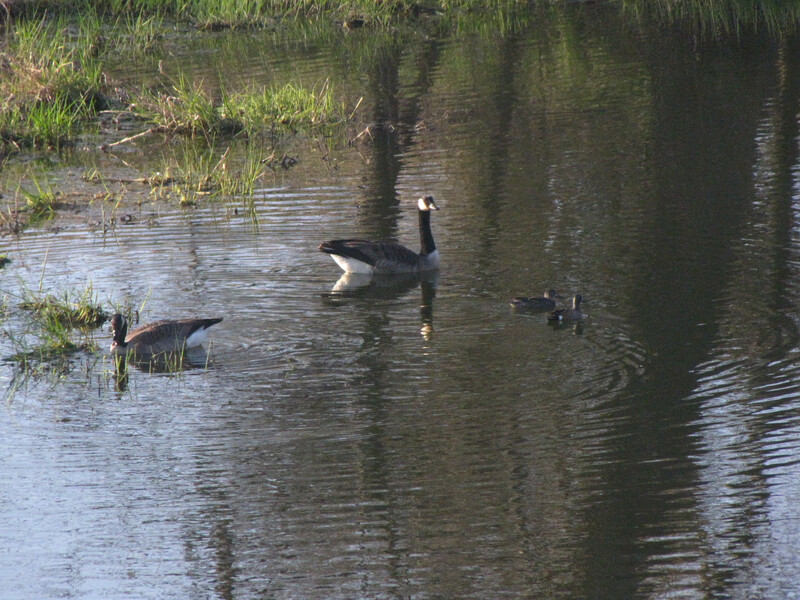 Observed seven different species of ducks on the pond in addition to several pairs of geese. The pond is back down to just being full, put the boards back in the water control device. Had a run in with some trespassers backing their quad and motorcycle down the edge of the pond dam and spinning out going up and over the dam. I won. Son got his turkey Saturday morning in Indiana, his season opened up this morning in Michigan and he had his down at 7:44 AM today. 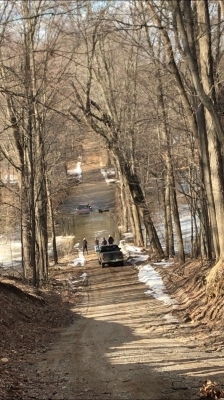 Watched a couple trucks stall out in the deep water on the seasonal road that floods when I release water from the dam and get towed out. The picture below is from a few weeks ago, the water was at least 1.5' deeper now when they tried to get through. The one truck which didn't make it through yesterday was a 2016 Chevy diesel, it sounded as if it sucked water in before it stalled so he might have an expensive repair bill. Before they pulled it out the water was about 3" over the bottom of the door windows. Highly entertaining to watch them open the doors and see the cab full of water run out after it had been pulled to dry land. Taking a chance and planting about 2 acres of buckwheat today. It's a few weeks early and hoping we don't get a hard frost after it comes up. Bryan, thanks for the update! Sounds awesome all the fun you get by your pond! Sounds like you need to patrol the area regularly and get some game cameras with the trespassers there. You would probably know, as long as I have a mallard duck pair on the pond will I not get a wood duck pair to join them? I know people wait many years to get wood ducks and my pond is a long shot due to activity around it (and my dog who can't get too near it but the fence does allow him in the vicinity), but I also wondered in a small pond how a mallard pair and a wood duck pair would get along? The female mallard is on the nest (somewhere) and the male sleeps in the shade or swims in circles in the middle of the pond every day waiting for her. I think mallards and woodies do fine on the same pond. I see them (and other ducks) intermix while cruising around our pond frequently. 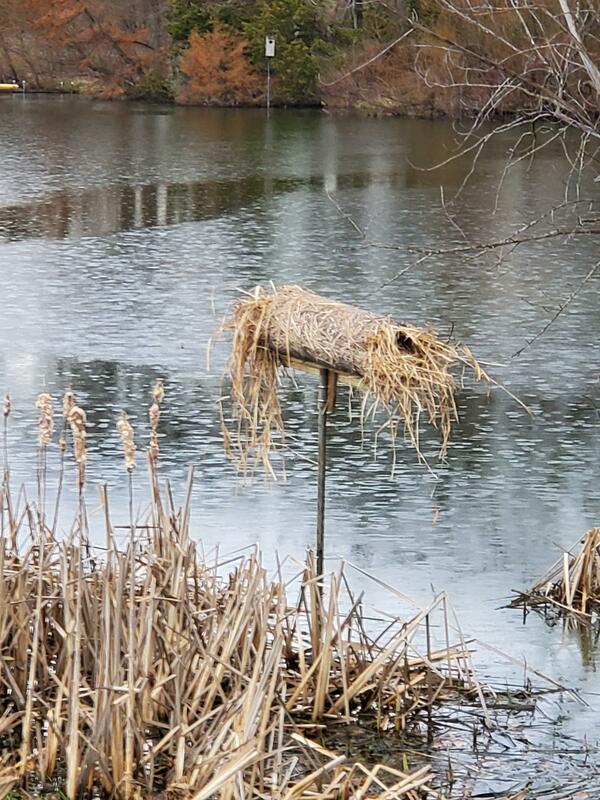 You could always put up a mallard nesting tube, in addition to the wood duck box. Below are blue wing teal and Canadian geese, hanging out..